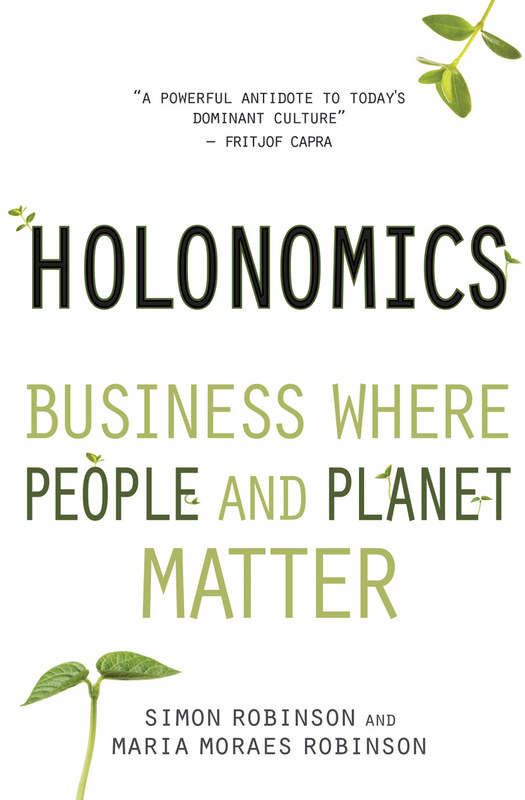 Maria and I cordially invite you to take a look inside our new book Holonomics: Business Where People and Planet Matter. In this preview you will be able to read the table of contents, the foreword from Satish Kumar, our preface, and chapter one. To see the review, please click here. You will also be able browse through the endnotes, biliography and index by viewing the book on Amazon. In terms of when the book will be available, we have received some news back from Floris Books that Holonomics could well reach distributors in the UK by 7th April, so those of you who have already kindly placed pre-orders, for example with Amazon or Waterstones in the UK, could well be receiving your books quite soon. As always, Maria and I would like to thank all our friends who have supported Holonomics throughout the writing and publishing period, and we are now looking forward to really engaging with you all in a discussion of holonomic thinking, and how it can be introduced in your businesses and organisations. I’ll be ordering the book in advance from BookDepository dot com – You and I are both interested in Goethe’s approach to observing and learning from the world around us. I wonder if you know of the work of Stafford Beer? Of the many models of systems I have explored, his is one of the few that clearly builds in (recursion, fractal relationships) in that systems are made at their foundation of lower-level systems. Branch office and headquarters. What would have been fascinating to observe – his work with Salvador Allende in Chile to structure the communication among government entities. The local office would deal with local matters, following general guidelines. Unusual and difficult matters get flagged for attention by the larger level(s) of a system. They never got the chance to put the ideas into practice. The US govt had a large role in Allende’s overthrow and Pinochet becoming dictator. One of many stains in US history, to my eyes. This is a small taste of deeper ideas. He has written many books – on Systematics in Brain of the Firm (1972, 1981) and The Heart of Enterprise (1979) – these approach Systematics from top-down & bottom-up; or the briefer “companion volume” to these, Diagnosing the System for Organizations (1985). A more recent work, Beyond Dispute: The Invention of Syntegrity (1994) describes his use (he pulls from Bucky Fuller) of the interconnections among points on an icosahedron to structure a series of interchanges among groups of a few dozen people. One aim is to optimize for more interchange. One of his early books, Platform for Change (1975), came out of being elected president of the Operational Research Society for the years 1970 and 1971. I’ll end this post to aim for some brevity. Hi Sigurd, Many thanks for your comments. Yes, both Maria and I have a deep interest in Goethe. It is for this reason that half of the book is dedicated to the dynamics of seeing. We feel that without this understanding, no other frameworks can follow, as people will not recognise the need to explore their mental models to achieve a joint understanding of the meaning of what they are discussing or studying. We really hope you enjoy Holonomics – it has been really rewarding putting it into practice with organisations and seeing the resulting change in people’s outlook on the world. about a new sort of world. that I have not been able to manage without. The next color, light blue, begins on page 15.
and of his stereotypes of himself. has been programmed to deal with a vanished world. Complexity is the very stuff of today’s world. Having culled the above to perhaps whet your appetite, I’ve whetted mine, and will put this last book (of all the above, the one I’ve delved into least) into my “read more closely than the first time round” collection.